The Latino population is the fastest growing ethnic group in the United States, but the least likely to visit National Parks and natural areas. 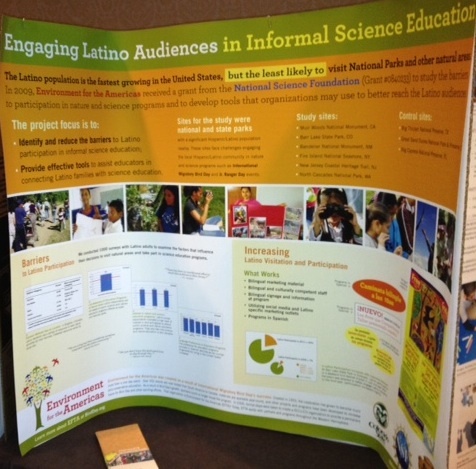 In May 2009, Environment for the Americas received a grant from the National Science Foundation to study the barriers to participation in nature and science programs and to develop tools that organizations may use to better reach this audience. Broadly disseminate these tools to agencies and organizations challenged to engage this audience in informal science education. Toolkit — Based on our research findings & Latino outreach experience, EFTA created an Outreach Toolkit with suggestions & ideas on how nature-based sites can improve their capacity to reach this audience. Resources — Find educational materials, multilingual activities, journal articles, and web links that will build your knowledge and capacity to engage Latino communities. Susan Bonfield, Executive Director of Environment for the Americas, is the principal investigator of the project. Carol Biedleman, Park Flight Coordinators for the U.S. Park Service is the co-principal investigator.